The Hubbard Brook Experimental Forest (HBEF), located in the White Mountain National Forest of central New Hampshire, was established in 1955 by the USDA Forest Service. The Forest Service Northern Research Station has used the HBEF to help pioneer the small watershed technique as a method of studying ecosystem processes, including tree phenology. In 1989, the Forest Service established observational phenology plots in the HBEF. Each year, they document seasonal timing of leaf out and leaf fall at the experimental forest using routine observations of tree phenology. They designed a phenology index, and they document spatial and annual differences in leaf emergence and senescence. The remote phenology plots in the HBEF are subject to harsh weather conditions throughout the year. The climate of the HBEF varies with altitude, but its predominant features include large and rapid weather changes, broad daily and annual air-temperature ranges, and uniform monthly precipitation. The Forest Service wanted to expand its knowledge of the growing season at the HBEF by increasing the frequency of its phenological measurements. With this goal in mind, the Forest Service decided in 2010 to automate their study by installing the first of several remote webcams. The purpose of the webcams is to complement the observational phenology data with year-round, high-resolution, digital color information. Onsite Forest Service staff installed a network of StarDot NetCam XL webcams to capture hourly images of entire watersheds. Nine gaged watersheds within the HBEF monitor inputs and outputs of water quantity and quality. The webcams also capture hourly images of nearby Mirror Lake to detect the presence of ice on the lake. These images enable the Forest Service to track ice-free days on a year-to-year basis. The webcams are controlled by a remote Campbell Scientific CR1000 datalogger with an NL120 ethernet interface using LoggerNet software. To minimize power consumption at the sites, the CR1000 supplies power to the webcams for 10 minutes per hour during the day, allowing just enough time to collect and store hourly images. The Forest Service worked with Campbell Scientific on program troubleshooting and equipment configuration to ensure that they capture the desired images at the correct frequency. The images that are collected and stored on the CR1000 are transmitted hourly to the LoggerNet server, which is hosted on a desktop computer in the Forest Service office. The transmission occurs via a wireless RF450 spread-spectrum radio. 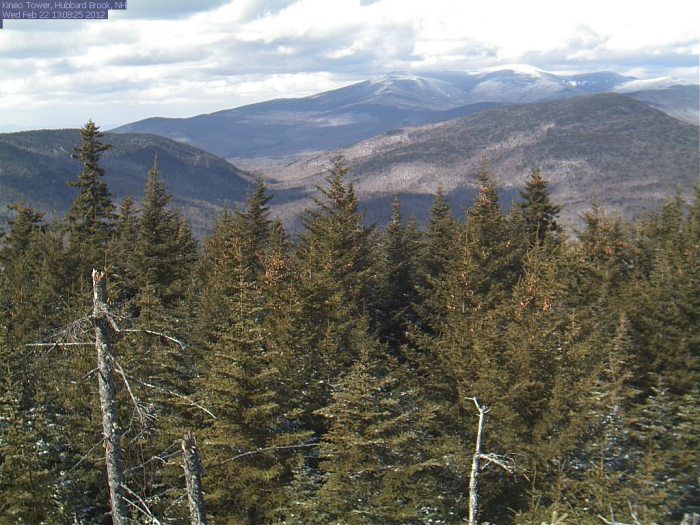 The images are then forwarded to a phenocam network team for processing and web hosting: http://hubbardbrook.org/data/webcams.shtml. Because of the remote location of the forested observational sites, the onsite equipment is powered by directcurrent photovoltaic systems. The continued use of digital imagery provides the Forest Service with automated, frequent monitoring and data recording for investigations of tree phenology, and the imagery enhances the organization’s understanding of ecological processes. The Hubbard Brook Experimental Forest serves as a living laboratory for long-term research that can be applied to the nation’s forest lands.